We’ve been busy working on a new performance feature for Equalizer: Dynamic Frame Resize (DFR). DFR automatically adapts the size of the rendering to achieve a constant framerate, which works very well for fill-limited applications such as eVolve. Of course, true to our mix-and-match strategy, it can also be combined with other scalable rendering features. We are pleased to announce the release of Equalizer 0.5, a framework for the development and deployment of parallel OpenGL applications. Equalizer 0.5 adds a number of features to increase the scalability, most notably pixel compounds for fill-rate-bound applications and a 2-4x performance increase during sort-last compositing. The Programming Guide has been extended to 43 pages and covers various new topics. Preview the content and order your hardcopy today at lulu.com! Equalizer 0.5 now uses GLEW to provide easy-to-use OpenGL extension handling in parallel OpenGL applications. The new support for off-screen PBuffers on all platforms opens new use cases for Equalizer-based applications, for example seamless integration for scalability on multi-GPU workstations. Where available, image compression during network transfer has been accelerated using OpenMP. The full release notes for version 0.5 are available at http://www.equalizergraphics.com/documents/RelNotes/RelNotes_0.5.0.html. Equalizer just got something new for all you ray-tracing and volume rendering people out there: Pixel compounds. The load is always almost equally distributed, thus allowing to scale the fill-rate nearly linearly. The frustum for the source channels gets distorted so that the channel only renders 1/nth of the pixels in one dimension. Afterwards the frustum is moved slightly to select the ‘starting’ point of the channel. 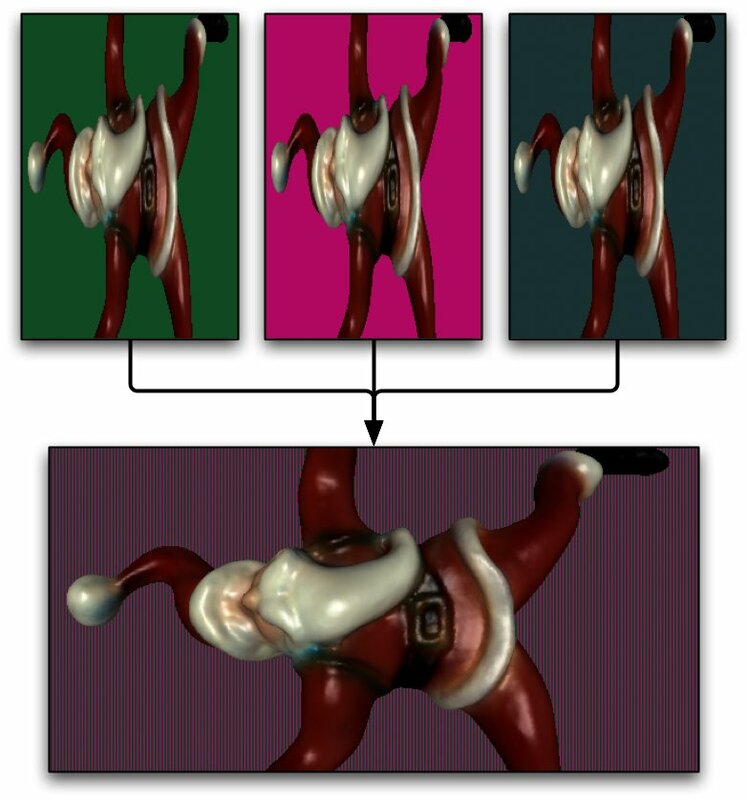 OpenGL functionality which is influenced by the raster position will not work correctly with pixel compounds, or needs at least special attention. Among them are: lines, points, glRasterPos, glPolygonStipple. On the right you’ll see an image of it in action. The backgrounds are colored differently for illustration purposes. Click on the image for a high-res version.